Take center stage with Angelina Ballerina. Read, watch, play, and twirl alongside the world’s most delightful little dancer as she meets Ms. Mimi on her first day of dance class at her new school. Ms. Mimi is nothing like Angelina expects her to be, and Angelina worries that she’ll never fit in at her new school. Can Angelina work things out with Ms. Mimi, or are her dancing days over for good? 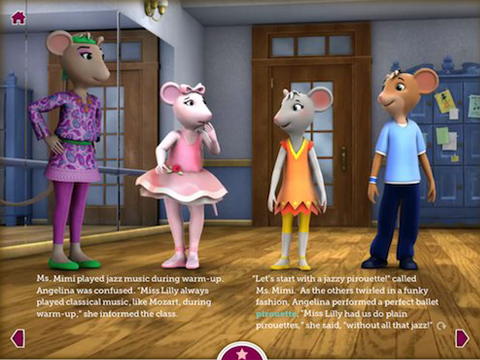 Angelina Ballerina's New Ballet Teacher is a delightful interactive reading experience the whole family will enjoy, with unique navigation that magically transforms each page of the story into a painting page and puzzle activity at a touch of the screen.